As many businesses and high net worth individuals scramble to engage in year-end tax reduction strategies, many will find themselves investing in what the IRS considers an abusive tax shelter. Thousands of taxpayers each year rely on insurance agents and financial planners for complex tax advice. That sometimes results in big problems, according to Wisconsin tax lawyer Brian Mahany. Mahany says the problem is acute with so called “419 plans” and captive insurance companies. The IRS considers these plans as “listed transactions” subject to extra scrutiny and special reporting. Although many of these plans are legitimate if properly constructed, failing to report them annually can subject taxpayers to a $200,000 fine. 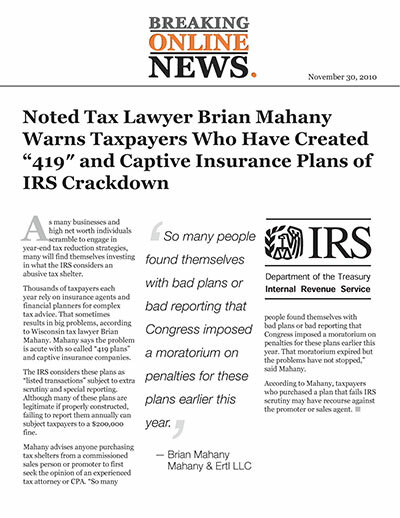 Mahany advises anyone purchasing tax shelters from a commissioned sales person or promoter to first seek the opinion of an experienced tax attorney or CPA. “So many people found themselves with bad plans or bad reporting that Congress imposed a moratorium on penalties for these plans earlier this year. That moratorium expired but the problems have not stopped,” said Mahany. According to Mahany, taxpayers who purchased a plan that fails IRS scrutiny may have recourse against the promoter or sales agent.